The living wealth of the Earth. Biological diversity is one measure of any area's ecological productivity as it is distributed among a variety of species or conditions; that is a measure of how much nutrition is available to living creatures from solar radiation, nutrient cycling, water and air. Biotic diversity is thus, a metric revealing how available calories from bacteria and plants are distributed among plants, bacteria, fungus, and animals. 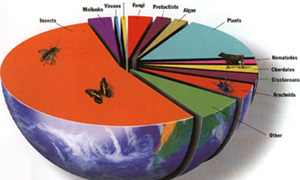 Here is a representation done by the American Museum of Natural History depicting the percentage of creatures by their biological affiliations and their mass on earth. From the adjacent drawing it becomes obvious that humans are just a minor member of this living assemblage. Consider that insects account for over half of the creatures on earth by weight and variety of species. Among insects the vast majority by weight and the most diverse group on earth are beetle's; the coleopterans. Wildlife and global warming's impacts. What this means is that the large animals that we associate our own species with, many among the grouping called the chordates, are utterly dependent on the far more numerousness – and often unseen– crustaceans, arachnids and insects that have been developing on Earth for the past 300 million years. Humans by comparison have descended from a family that is not much older than three to six million years. In addition to the dependence of large obvious animals like elephants, lions and pandas on the smaller creatures, the insects, crustaceans and arachnids are dependent on fungi, algae, protoctists, plants and bacteria. The whole concept of biological diversity refers to the capacity of the worlds creatures to sustain other creatures because of their productivity. Without such diversity there would be no agriculture, no pollination of crops and groves, no civilization. The loss of biotic diversity. So what is biological diversity? This flywheel that drives the productive potential of the living world? Biological Diversity is the product of the dynamics of energy flow and nutrient cycling in ecosystems. Human beings, both individually and collectively, have always sought to transform their surroundings. 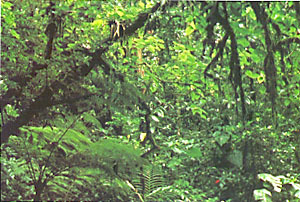 But for the first time, they have begun to play a central role in altering global biogeochemical systems and the earth as a whole. . . . the loss of biological diversity is a by-product of varied human activities, including the clearing of tropical moist forests for agricultural purposes. . . . According to the United Nations World Conservation Strategy and the National Research Council, the loss of biological diversity is an indicator of the ecological health of the planet from which the economic development of all nations ultimately derives. Seeing and acting on such an interdependent relation among atmospheric warming, biological diversity loss, and human social well-being is the larger goal of ecological problem solving. The method of ecological science. Seven species of evolutionarily rare species, other than the northern spotted owl, exist because the conditions of the old-growth forests nourish their existence. $4 billion dollars worth of timber is at stake as 3000 remaining breeding pairs of spotted owls remain affecting 800 to 2500 hectares of habitat per pair. ($8 million per pair) Timber leases are subsidies to lumber companies since the purchase price of the lease is less than the cost of maintaining the forest! Any forest is like a savings account in that it earns interest at an accumulating rate. Like a bank account rivers and other natural features require an investment if one is to anticipate a withdrawal without losing the earning power of the account. The lumber that comes from particularly old forests of 80 to 180 year old trees is of higher quality than the lumber of recently planted forests. Like an older savings account the accumulation of wealth is greater in a forest as it matures. Global hotspots where biological diversity is under assault and declining. 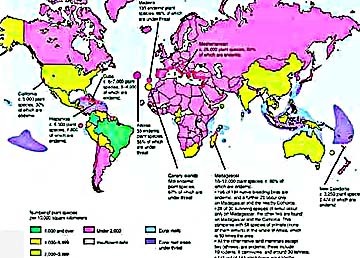 About twenty places on earth are characterized by a rapidly growing human population in close proximity to nurseries of creatures with a high degree of species richness, or extremely varied habitats, or sources of genetic variability. These genetic hearths are where we derived many of our domesticated crops and animals. the different strains of DNA are an insurance against a blight, disease, or ecological change that might threaten the species. Florida panthers & African Cheetahs are not. 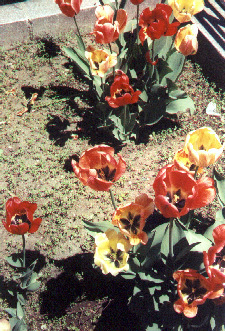 the varieties are sufficiently different from one another in function, life cycle, or zone of exploitation such as beetles. the conditions of substrate, slope, temperature, pressure, altitude, moisture, radiation exposure, and nutrient availability varies from place to place. Genetically specialized plants and bacteria capture solar energy or reduce minerals from the earth's heated waters transferring this energy, fuel, or fiber along food chains to all other living organisms. The genetic viability of all life ultimately depends on bacteria and plants that form webs of biotic communities where fungi breakdown material to make nutrients readily attainable by plants and animals. The relative abundance of species may be influenced by availability of resources, or competitive interaction. "This failure to understand the production and maintenance of species numbers suggests that ecologists might phrase the problem of diversity better in terms of the factors that influence speciation, competitive ability, and degree of specialization which, after all, determine the number of species that can coexist in a community." competing – rival organisms (creatures, life, beings). I can not imagine a scientific problem of greater importance for humanity. than the loss of biodiversity. Biodiversity is our most valuable but least understood and most under appreciated asset. "Its potential is brilliantly illustrated by the maize species Zea diploperennis, a wild relative of corn discovered in the 1970s by a Mexican College student in the west central state of Jalisco, south or Guadalajara." The new species is resistant to diseases and unique among living forms of maize in possessing perennial growth. "The Jalisco maize was found just in time, however. Occupying no more than 10 hectares (25 acres) of mountain land, it was only a week away from extinction by machete and fire." "For a start we need to reclassify environmental problems in a way that more accurately reflects reality. There are two major categories and two only. One is the alteration of the physical environment to a state uncongenial to life. 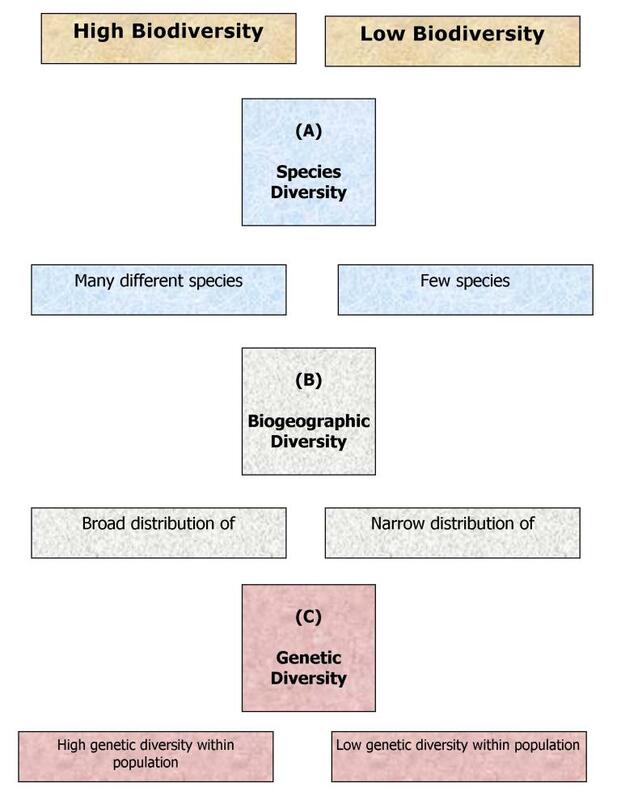 The second category is the loss of biological diversity. Its root cause is the despoliation of the physical environment, but is otherwise radically different in quality." permanent loss of genetic information on past ecological conditions. must be struck to assure biotic diversity in maintained. "The problem of collective meaning and purpose is both urgent and immediate because, if for no other reason, it determines the environmental ethic. Few will doubt that humankind has created a planet-sized problem for itself." "The global population is precariously large, and will become much more so before peaking sometime before 2050." "eating up the planet's capital, including natural resources and biological diversity millions of years old. Homo sapiens is approaching the limit of its food and water supply. Unlike any species that lived before, it is also changing the world's atmosphere and climate lowering and polluting water tables, shrinking forests and spreading deserts." One outcome of ecological problem solving is to imagine several opportunities to enhance complementary values in a single solution to a perplexing situation where conflict would otherwise destroy the viability of essential ecological services. The most biodiverse nations in variety of life.